​This pretty range is full of the promise of Easter and Spring! 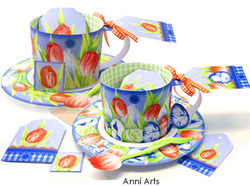 Spring Tulips and Easter Eggs in fresh green, cobalt blue and vermilion red. This original pencil crayon drawing has tulips, painted Easter eggs and feathers. ﻿Includes Cards, Packs, 2D and 3D Cups, 2 Cradle Cups, 3D Mug! 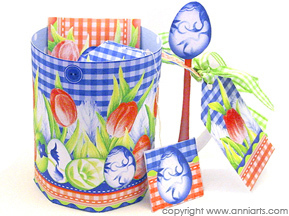 SPRING TULIPS and EGG CRAFT ranges have more than 35 pages. Pay securely with a CREDIT CARD or your PAYPAL ACCOUNT. ​You do NOT need a Paypal account to buy. ​This is a digital download product. Wrap eggs or candles in the border design, fill the square basket and fill the bonus sachet with spring fragrances or seeds. Add the bookmark to a spring poem collection. Use the serviette ring at Easter breakfast. Print a smart square card and envelope for easy Easter wishes. Many card designs are possible with the card making kit, layered card and aperture card. Further template crafts can be made with the geo pattern pages. The pretty and printable Easter Keepsake 3D mug and unique gift presentation tray is combined with tea box and tea envelopes.The mug and tray have wrap-around Easter eggs and there is an egg on the tag and teaspoon. Included too, is patterned paper to print as lime geo set and several single pages with various items as inner lining for the mug or to use as coordinating gift wrap. Do you like the Spring range? Should I add items? Scroll down to comment !